LiveCode LessonsLiveCode ReleasesLiveCode 6.7 In App PurchasingHow do I implement in-app purchases in LiveCode - Apple AppStore? In order to use the in-app purchase with LiveCode, we must first create it in iTunes Connect. From the front page of iTunes Connect, go to "Manage Your Applications", select the app for which you wish to create an in-app purchase, click "Manage In-App Purchases", and click "Create New". From there, follow the instructions to create the type of in-app purchase you wish to use. In the stack for this lesson, we are using a consumable and a non-consumable purchase. First create two buttons. One button for consumable, and one button for non-consumable purchase. Then add code that allows us to interface with iTunes Connect and request the in-app purchases for download. The mobileStoreSetProductType command is used to set the type of the in-app purchase. The type can either be “inapp” for consumable and non-consumable items, or “subs” for subscriptions. This distinction is not always necessary, since it is only used by the underlying Google API for in-app purchases, because it uses different methods, depending on the item type. However, it is recommended that you always use this command, even for non-Google stores. 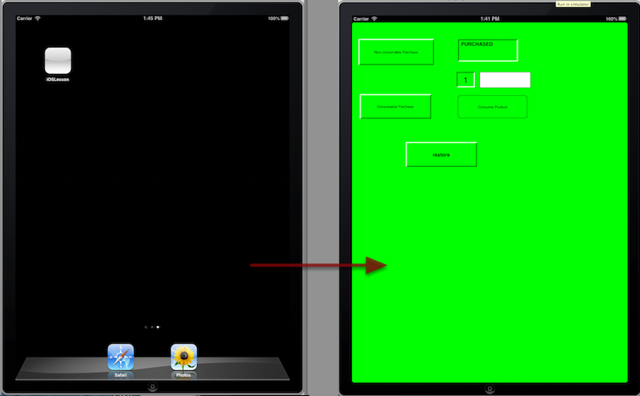 The mobileStoreSetProductType command is used with the identifier and the type of the in-app purchase we are requesting. These values must match the identifier and the type of an in-app purchase that has been set up in iTunes Connect for the app. The mobileStoreMakePurchase command is then used with three parameters, denoting the in-app purchase identifier we are requesting, the requested quantity of the item and the developer payload. The quantity should always be “1” for non-consumable and subscription items. The developer payload is a string that contains some extra information about the order. This command sends the request and begins the purchasing process. The purchaseStateUpdate message is then generated as the purchasing process takes place. This is sent with three parameters denoting the product identifier, the purchase identifier and the state of the specific purchase that the message is regarding. In the handler, the state of the purchase is checked using the parameter pState. Here we take action if it returns paymentReceived, indicating that payment for the purchase was received, or restored, indicating that the restoration request was successful. In all other cases, we print a message to the screen giving details on what has happened. In case of an error, we can use mobileStorePurchaseError with the purchase ID to find the details of the error and then use the mobileStoreDisablePurchaseUpdates command to indicate that the purchase process is complete. In cases where the item is already owned by the user, or in cases where there is no item with the specified identifier in the store listing, or in cases of the user cancelling the purchase, we use mobileStoreDisablePurchaseUpdates again. In case of payment being received, we take action in our app to finalize the purchase process. As there are multiple possible in-app purchases in this app, we use the pProductID parameter with offerPurchasedProduct method, to find out which in-app purchase we are dealing with. We can then take appropriate action for the in-app purchase that has been purchased, and use the mobileStoreConfirmPurchase command to confirm to Apple that payment has been received, or that the restoration operation has been successful, finalizing the in-app purchase process on Apple’s side. The bundle identifier that you create the standalone application with (as specified in the standalone application settings\Pmust match the bundle identifier tied to the in-app purchases in iTunes Connect. We can now use these custom properties to take action based on the in-app purchases the user makes. 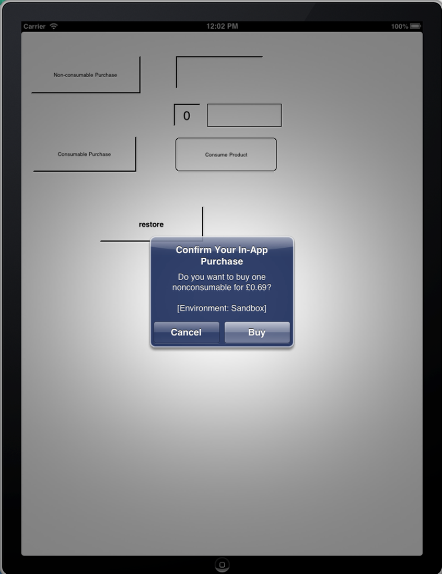 Handling the in-app purchase process records the purchases with Apple and transfers money. 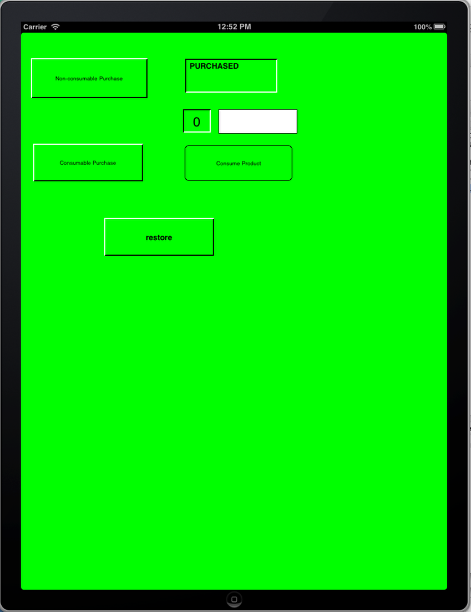 For this app, we are using the non-consumable purchase to change the background color of the stack and change the text of a field. The consumable purchase is used to make a graphic flash on and off briefly. put "NOT PURCHASED" into fld "purchased"
For the consumable purchase, we want the user to be able to activate it whenever they want rather than immediately. For this we use two handlers, a setProp and a button. The setProp indicates to the user how many consumable purchases they have remaining, and the button is used to activate the consumable. This will let use 'use up' a consumable each time the user clicks the button, and only let them carry out the action we want if they have purchased a consumable in the first place. One problem that you may have noticed, is that it is not possible to save a stack that is running under iOS (due to technical restrictions imposed by Apple). Therefore, our custom properties will revert to whatever values they are at build-time, each time the app is closed. We therefore need to somehow save our custom properties, so that we can re-load them every time we open up the app on our mobile device. A first thought would be to use a restore button. 1. Consumable products cannot be restored (for our example, this means that purchaseStateUpdate will be not be called with productID = "com.runrev.sampleapp.consumable"). This is because consumable products are not meant to be available in any device other than the device where they where originally purchased. Thus, we need a mechanism to store locally that the user has purchased a number of consumable products. 2. Non-consumable products can be restored, but is recommended by Apple not to use the restoration operation that often. Restoring purchases prompts for the user’s AppStore credentials, which interrupts the flow of your app. Because of this, do not automatically restore purchases, especially not every time your app is launched. Thus, we could again use a mechanism to store locally the non-consumable purchases of the user, and use the restore button only in cases where the user switches devices. We now have a system which can control our in-app purchases simply by setting the value of the relevant custom properites, without having to worry about manually saving or loading them, or losing them. Note: You have to include some mechanism in your app to let the user restore their purchases across different devices, or else your app will be rejected by Apple. From the front page of iTunes Connect, go to "Manage Users", select "Test User", and click "Add New User". From there, follow the instructions to create a new test user account. You will need a test user for each territory you want to test the app in.\L Then clear any account information stored on your test device. (Settings -> Store -> Sign Out). Do not sign in using your test account information in the Store settings panel. Doing so may invalidate your test account.\L\L\L Then launch your app and make a purchase. A window pops up and prompts you to sign in. Choose "Sign in using existing Apple ID", and use your test account credentials to sign in. You will not be charged for any purchases you make using your test user account. If you notice unusual behaviour in the purchase flow, for example a "Cannot connect to iTunes store" error, then try creating and using a new test user account. 1. Auto-renewable subscriptions, where automated billing occurs every fixed period. 2. Non-renewable subscriptions that are not available after the period expires. These are like short-term items. The user can buy an item again after it has expired. Apple has placed strict rules around auto-renewable subscriptions, meaning their usage is (usually\P exclusive to Newsstand apps. As a result of this restriction, the subscription item that was used in the other 3 in-app purchase lessons for the android stores is not ideally suited for the Apple AppStore. We can use that subscription item for testing purposes, to see how automated billing occurs, but it is most likely going to be rejected by Apple in the app approval process, because it does not fall into the category of products that are suitable for auto-renewable subscriptions. This means that if we want to use the same example for this lesson, we have to implement it as a non-renewable subscription. 1. Checking the purchase date of the non-renewable subscription item and making sure that the item will only be available during this period. This could be implemented by locally storing the purchase time in the app and checking each time when the app launches if the period has expired. 2. Making the non-renewable subscription item accessible from every device the user owns. This means that locally storing the purchase time is not sufficient. The solution could be to store the purchase time - as well as the user's email address on a server, and checking each time when the app launches if the period has expired. Prev: How do I implement in-app purchases in LiveCode - Samsung Apps Store?